As many readers already know, we’ve been working really hard to eliminate the color brown from every room of the house. Not the color-of-our-new-floors brown, but dark, outdated-looking, dark brown, stained wood. 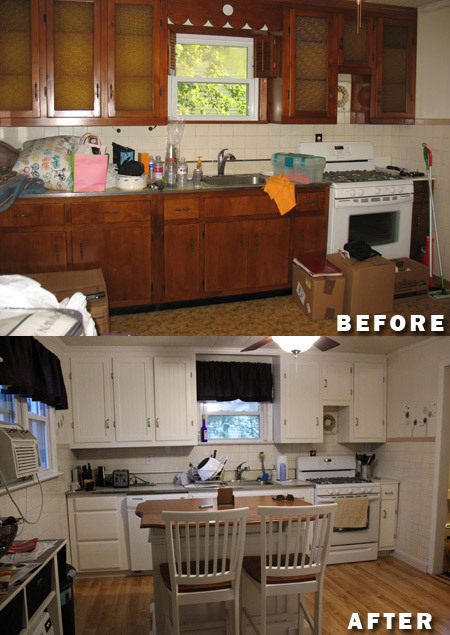 We started right away with the yucky brown cabinets in our kitchen. Then we moved onto the trim throughout the kitchen and the weird ceiling tiles with the brown lines running through them in the living room, office and bedroom. Last but not least; the dining room and hallway. Oh the dining room and hallway. So brown, so ugly, so dark and limiting. Such a simple painting project and a small adjustment has made a HUGE difference. 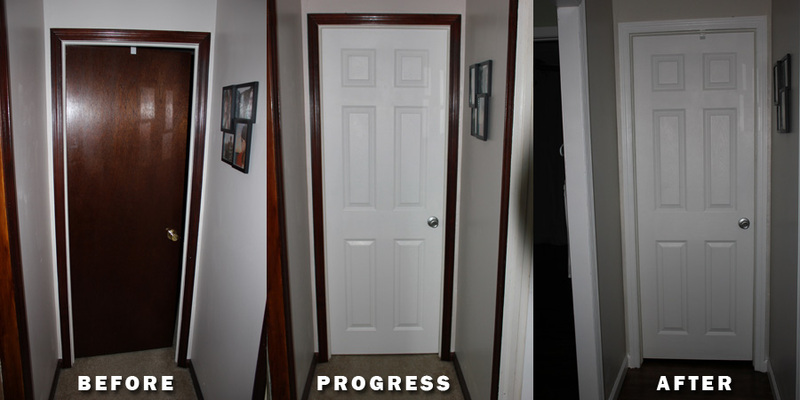 I knew I hated the brown trim, but I had no idea just how much better the dining room and hallway would look with the all-white trim, doors and ceiling. 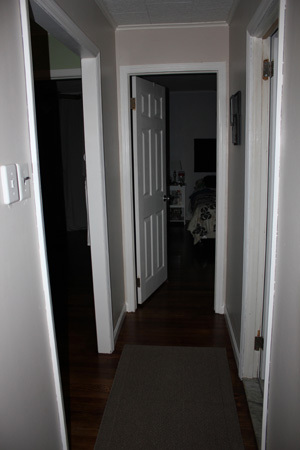 Look how much brighter the whole space looks, especially in these shots of the hallway leading to the bedroom door! I find myself looking past the trim now and actually seeing each room. The dark brown trim really drew your eyes in and sort of stopped you from seeing what was ahead. See what I mean? What a relief! We couldn’t be happier with this makeover and it was all in less than half a day’s work. 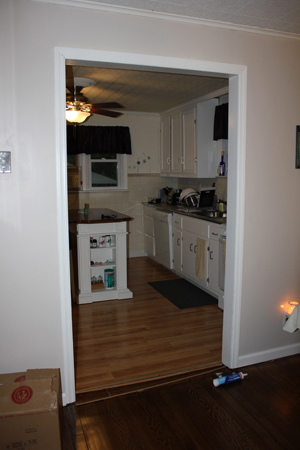 This entry was posted in Before and After, Dining Room, DIY, Home Improvement, Home Remodel, Home Renovation, Paint, Painting and tagged dining room, diy, home improvement, home remodeling, painting, painting trim by Andrew. Bookmark the permalink. You’ve done a wonderful job. Everything looks so fresh and new. I agree the white trim looks bright and fresh. The brighter the better in a small area. The house looks great, can’t wait to visit to see the whole picture. Thats really amazing! What I difference. I love your kitchen btw. That little island is sooo cute! Hehe I think everyone hates what they’ve got too much of – moved into an old Victorian home that is entirely white, and trying to get rid of all that plain and boring white by introducing a little dark brown! In a classy way of course, oak/mahogany stuff, not Ikea plywood. I do love your kitchen re-dec though, looks much more modern. There is definitely some truth in that! 🙂 I’m glad you think our re-do is much more modern – that’s what we were going for. Thanks! Hi there! I’m contemplating giving our white dropped ceiling tile in the basement a quick coat of paint to get rid of the dingy grey tone they’ve got going on 🙂 May I ask what method you used to brighten up your ceiling tiles? We just used regular ceiling paint, specifically the kind that paints on purple and dries white. For a project like this it was perfect. We brushed between the tiles and then rolled over the rest. 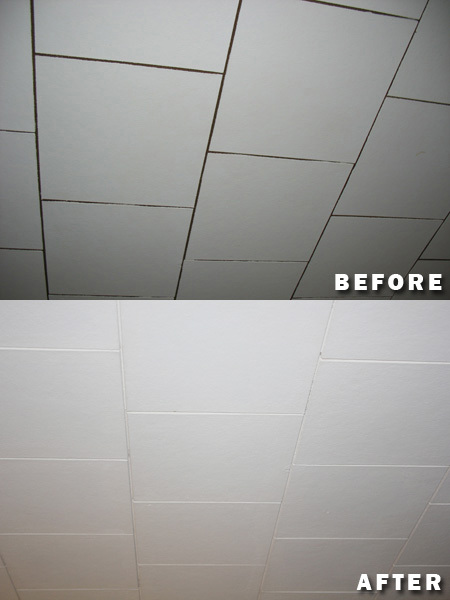 Our tiles were a little different than regular drop ceiling tiles. These tend to be a little less absorbant. More like painting drywall. Hope this helps! The white trim is a big improvement. I’d raise that valance on that window, as it’s just covering too much. I think anything above 30% is too much for a valance to cover, and raising it will also mark the window look bigger. 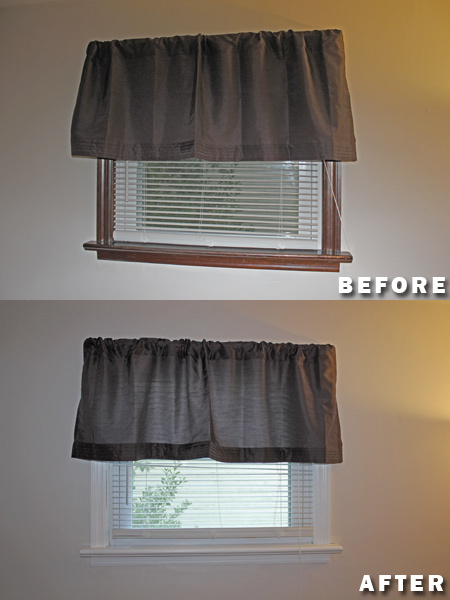 My first choice would be to nix the valance as part of your dark brown eradication and replace it with a Roman shade that hung longer than the window to disguise the size or an interesting drape. How did you do the indents on the brown-to-white door? ?